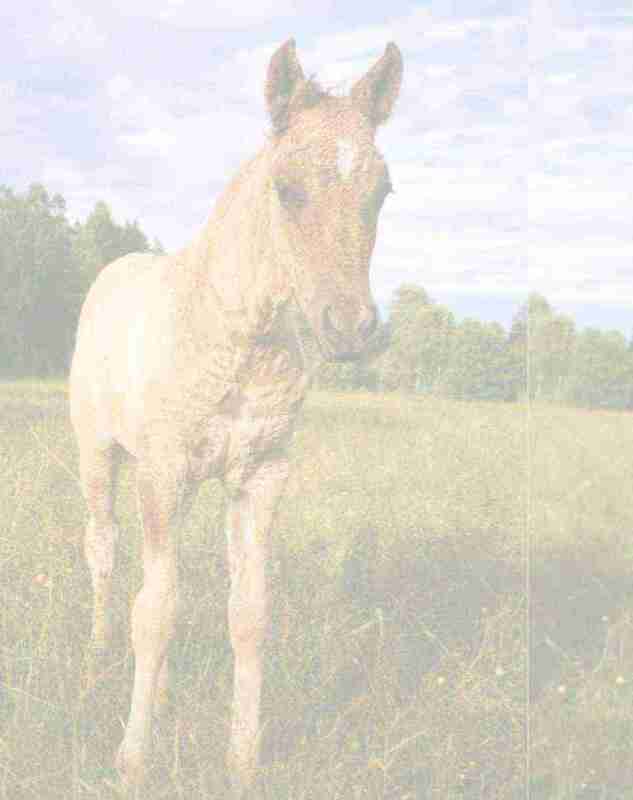 We were Europe's first breeder of gaited curlies with two gaited curly foals already the first foal crop in 2001. At the present we are Europe's largest breeder of gaited curlies, with five gaited curly broodmares. 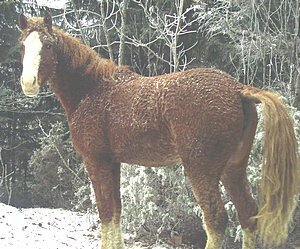 For the future we will concentrate on the gaited curly breeding and all our mares were in 2009 bred to a gaited curly stallion. Thus we have sold our curly pony stallion and two of the curly pony mares. We are keeping the smallest curly pony mare as riding and driving pony for our little son. 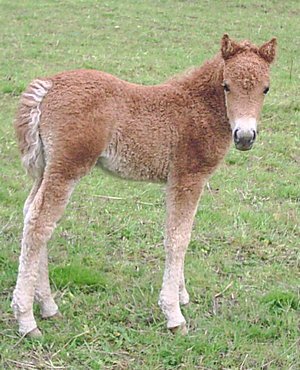 Sorrel filly, f. 30. July 2008. .
Five years ago I was searching high and low in the whole North America for a suitable curly pony mare. Not an easy task because small curly ponies are very rare. Finally I found *Sweet Pea in Missouri. I arranged to send her a day's trip to breed to a suitable curly pony stallion, and back again when she had become pregnant. The same fall she arrived in Norway. The result of the breeding was *Dakota Dream, who we sold to Great Britain, and she is now in France. But, since there did not exist any small enough curly stallion in Europe, I was unable to have Sweet Pea bred again. It should take a few more years before we jumped into it and invested in the USA stallion Pirate's Little Buccaneer EB in 2007. Where am I heading with this story you are thinking now? Well, five years waiting and a few hundred thousand kroner invested in curly ponies (import, raising/care, USA trips) have culminated in a wonderful result, namely *Pennsylvania Dream. Penny and her younger full sister, Carolina Dream, are the smallest curly pony foals born in Europe and probably the smallest curly-to-curly bred ponies in the world, together with their dam Sweet Pea. She is a kat. 4 pony (max 107 cm). I believe she will become an excellent pony trotter. She has already shown quick trot in the pasture and both parents can trot very fast. Penny is very gentle and has grown up with my son who was just a baby when Penny was born, I was never afraid for him to be around her. Penny is trained to drive and is used for giving kids pony rides as well. Penny is a fun pony wanting to be in the middle of whatever happens. Penny is flaxen sorrel of color. She also carries a gene for agouti (bay)(50% chance on passing the gene to foals) and she carries a gene for silver (50% chance of passing the silver gene to offspring). This means that if she later is bred to for instance a black stallion, the foal may be silver black (like Sweet Pea), silver bay, black, bay or red. Penny is homozygous for curls! Which means that every foal she has will be curly coated. Penny has been shown at official inspections for young horses both as a yearling and as a two year old and obtained the degree "Ribbon" both times. 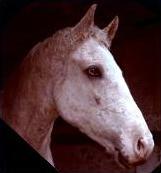 Sorrel sabino mare, f. 1995, ICHO 471-D, ABC 2012, MFTHBA 95-47305. Previous owner: Chester Clark, MO. Foaled 28th of June 2003 a colt by: *Cherokee's Black Hawk (*Shenandoah Cherokee x *Apache's Ebony Girl). *Wyoming Dream. Foaled 4th of June 2005 a filly by: *Texas Dream (*Stormy's Northern Light x LS Sassey Lady). More about *Nevada Dream. Foaled 28th of May 2006 a filly by: *Kansas Dream Tragically the foal was stillborn due to placentitis. Foaled 4th of June 2009 a colt by *Pirate's Little Buccaneer EB. More about *Wisconsin Dream. .
Foaled 14th of June 2010 a colt by *SS Walcurly Prince Trevino. More about *New York Dream. .
Foaled 21st of June 2012 a filly by *ZGC Durango. More about *Utah Dream will come later. Queen is a medium sized mare (14.3 hh), and very well put together. She is trained to ride and drive, and is very sweet and calm horse. I can put kids and beginners on her back with no worries. She has displayed the following gaits in addition to walk, trot and gallop; flat walk, foxtrot, running walk, stepping pace, rocking chair canter, speed rack and flying pace. Queen is one of the few dominant Curly Horses also registered in the Missouri Fox Trotter Horse Breeders Association, and one of only two such mares in Europe. More about the versatile Missouri Fox Trotting Horse. 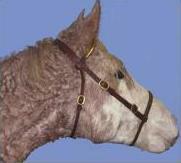 Queen is of pure Curly Jim bloodline, top and bottom, she is linebred on Walker's Prince T, the most important foundation stallion of the fox trotting Curly Horses. Her sabino pinto pattern and roaning is very rare in Norway, she is almost pink with white legs and face. She has big curls in the winter and a smooth summer coat. Her long thick mane and tail are mostly straight and does not shed at all, it's getting longer for every year. 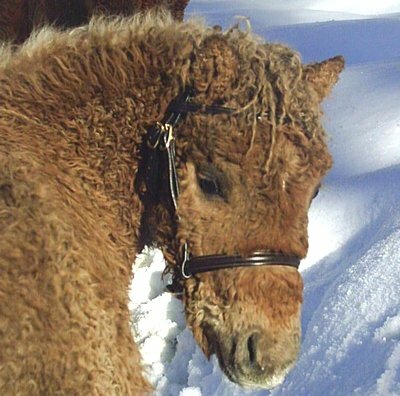 But even in the summer it is easy to see she is a Curly from the curls inside her ears, her curly forelock and very curly fetlocks. Queen is our best brood mare conformationally. She always produces foals that are very correct and well built, AND with excellent temperaments. Her two oldest sons has been inspected and approved at stallion inspections, and both her daughters have been exported, finally her 2009 and 2010 sons have been inspected and approved at young stock inspection. Finally, at 17 years of age, in 2012, we showed Queen at an official mare inspection. She was awarded a 1st Premium grade and the grade A for offspring. First Curly ever to get the top grade I believe! Palomino sabino mare, f. 1996, ICHO 471-D, ABC 2509, AFTHBA 96-F-8070. Previous owners: Steven & Teresa Fowler, IA. Foaled 24th of June 2003 a colt by: *Cherokee's Black Hawk (*Shenandoah Cherokee x *Apache's Ebony Girl). More about *Colorado Dream. Deceased. Foaled 9th of May 2005 a filly by: *Texas Dream (*Stormy's Northern Light x LS Sassey Lady). More about *Hawaii Dream. Foaled 17th of July 2006 a filly by: *Wyoming Dream (*Cherokee's Black Hawk x *Walker's Queen B). More about *California Dream. Foaled 27th of July 2009 a colt by *Pirate's Little Buccaneer EB. More about *Washington Dream. .
Foaled 3rd of July 2010 a colt by *SS Walcurly Prince Trevino. More about *Idaho Dream will come later. .
Foaled June 2012 a filly by *Kentucky Dream. More about *Alaska Dream will come later. Sonata is also of medium size and has a beautiful front end and neck. She has become my favourite riding horse. She has an energetic forward walk, a good flat walk and a smooth, rhythmic foxtrot with a distinct hock action and head nod. She can also rack, but prefers a rocking chair canter. 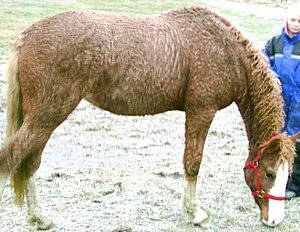 She is of pure Curly Jim bloodline too, her sire is a direct grandson of Curly Jim, and on her dam's side she goes to Curly Jim through Walker's Prince T.
Sonata looks cream colored, almost white in the winter, but in the summer she is a golden palomino with sabino ticking in her coat. She is dappled, has a wide blaze, and one hind sock. Her left eye is part blue and part brown. Her winter coat is tight curly, and she sports a "carpet" type summer coat. She has a curly long split mane that is thinning and shedding a little in the summer, but grows back very quickly, so it is 10" long at the end of the winter. Her tail is 3/4 long and seem to grow longer and longer. Sonata herself has been shown and approved with a 2nd Premium grade at official mare inspection. We are also proud of Sonata's production. Almost all her foals we believe are homozygous for curls but still with a decent mane and tail. Her first son is inspected and approved as a breeding stallion. Her three daughters are all exported. Her 2009 and 2010 sons have been inspected and approved at official young stock inspection. Previous owner: Sharon Goheen, OH. Fire is multi-gaited and does in addition to walk, trot and canter, also flat walk, fox trot, running walk, rack and flying pace! All at liberty in the field. Fire is half sister (same sire) to *Kansas Dream. Fire's mother Miss Firecracker (which is a very good looking mare), is half sister (same sire) to our best broodmare Queen. Thus we are quite certain Fire will be a nice broodmare. She has so far produced two good looking tall gaited colts. Fire is very human oriented. She comes right up to you and loves to be petted and scratched. She has in periods since she arrived from USA, just roamed free on our farm and she is not afraid of cars or construction machines and wants to be in the middle of what's happening. Fire is a quick learner and eager to please. Fire is a VERY calm mare, and unfaced by everything she is asked to do. Look at Fire's gaits! Not many horses will show such an abundance of natural gaits, running free in the pasture. She is also VERY smooth and a thrill to ride! Pictures are from when she was 2 years old. FIRE IS FOR SALE TO THE RIGHT HOME, WITH DELIVERY AFTER HER 2012 FOAL IS WEANED IN THE SPRING.